Getting extra memory for gadgets can be pretty cheap these days. Unless you’re talking about Apple’s iPhone and iPad, that is. Thanks to the absence of a memory card slot, getting extra storage for either device essentially means paying extra to get the 64GB or 128GB models. For folks who opt for the 16GB versions of the device due to cost or just the principle of it, however, life with Apple’s smaller capacity devices involves frequently erasing media, especially with memory-hogging features such as the “Recently Deleted” backup functionality or when “Photo Stream” is activated. It’s an issue that’s especially frustrating for folks who like to shoot video or download movies to their devices, further limiting the space available for apps. It’s apparently a challenge faced by many folks if the growing segment of expandable memory options for the iPhone and iPad is any indication. Examples of such devices include Sandisk’s iXpand and Wireless Connect portable drives. 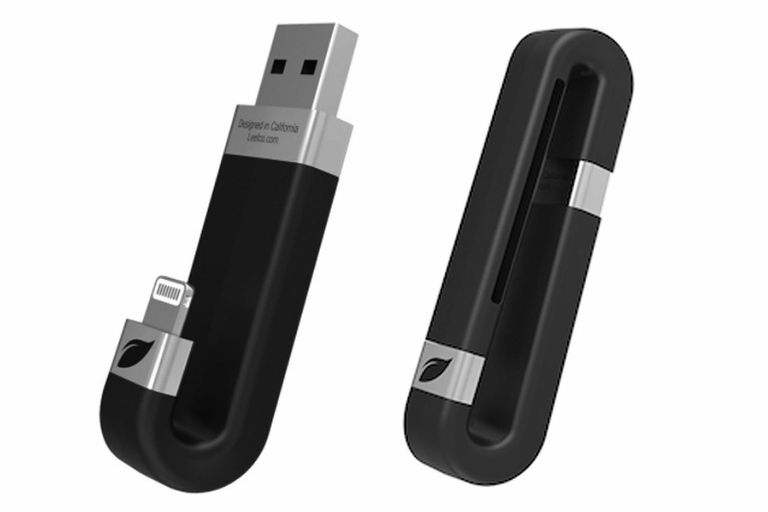 Now another similar gadget is entering the fray with the Leef iBridge Mobile Memory drive. Like the iXpand, the Bridge eschews the wireless approach of the Connect and opts for a physical connection. On one end is a standard USB connector for linking with desktops and laptops. On the other side is a Lightning connector for attaching the device to Apple’s latest iPhone and iPad offerings. Unlike the iXpand, however, the iBridge takes a less straightforward design approach that lets it loop behind the iPhone or iPad. It’s an interesting choice that comes with both pros and cons. The main advantage is a cleaner, more elegant look. Instead of having a dongle just sticking out, the iBridge’s curved design hides it behind the smartphone or tablet. The disadvantage is that it won’t work with thicker cases, so you’ll need to take your phone out of them. Using the iBridge itself is quite easy. Connect it for the first time and it’ll prompt you to download the iBridge app. Once installed, you can use the app to access the gadget’s features. These include moving or copying media to and from your Apple device, including photos or videos. You can’t move apps like you do with Android devices but that’s more of an issue with iOS as opposed to the iBridge. Transfer speeds won’t be as fast as when you connect your iPhone or iPad to a computer but still comes in handy when you’re out and about and don’t have your laptop or desktop PC close by. It took me about 6 minutes, for example, to transfer a little over half a gig’s worth of photos and videos from my iPhone 6 to the memory card. You can also take Instagram style photos straight from the iBridge app, which will save them into the portable drive itself. It’s a functionality that’s limited to picture taking and does not apply to video. Like the iXPand, however, one neat feature for the iBridge is the ability to view video straight from the stick onto your iPhone and iPad. This applies to video formats that both devices normally can’t play without downloading the requisite apps, such as MKV, for example. To test the functionality, we loaded some fansubbed anime in MKV format into the iBridge and it was able to play them and even show subtitles. We ran into issues with a few files where the movie would frequently pause to load the next scene and also fail to display subtitles. For the most part, however, it’s a function that works well. Instead, we'd say the biggest issue for the device is price, which ranges from $60 for 16GB to $400 for 256GB. At those prices, some folks might just simply opt for a cheaper alternative or splurging on a higher capacity iPhone or iPad. Still, the Leef iBridge is a nice addition to the growing line of portable memory sticks and drives for iOS devices. If you’re looking for ways to quickly expand the memory of your iPhone or iPad and don’t mind the price, the iBridge is a gadget worth trying out.